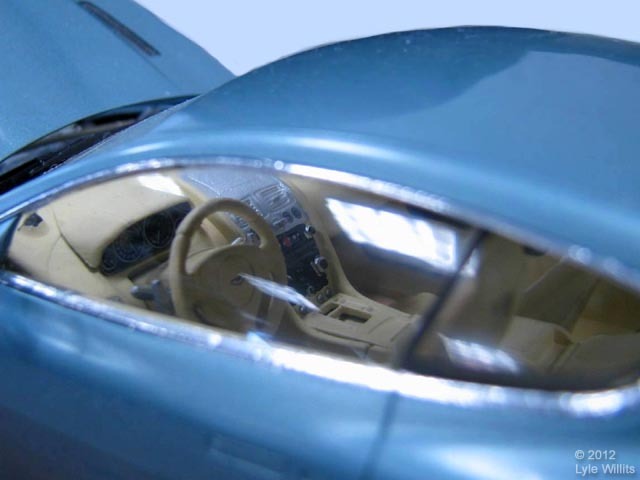 Here is a glimpse of how Rich and Tamiya replicated the hand-stitched leather interior which Aston Martin calls "cosseting and inviting." Note the absence of a shifter on the console or the column. That's right, it's a push button automatic -- shades of old Mopars! Aston Martin calls their rear mid-mounted six-speed transmission "Touchtronic 2". Though not visible in this shot, Rich added scratch-built seat and shoulder belts.